This fast-flying skipper exhibits crepuscular* behaviour and is more often seen in the early hours of the day or late in the evening. With a wingspan of 50-60mm, it is a large species, by Hesperiidae standards, with only the Gangara and Erionota spp surpassing it in size. Males are predominantly brown on the upperside and unmarked, whilst the females are deep iridescent blue above. The undersides are orange-brown with pale orange cellular streaks. 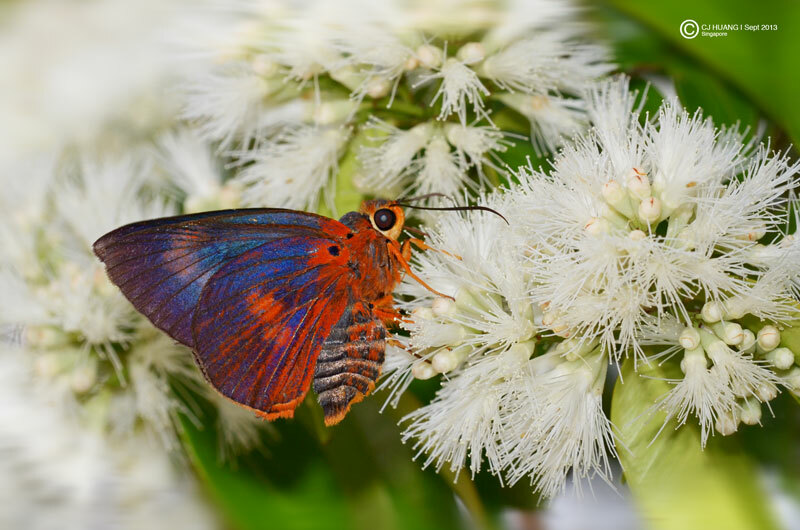 This individual was photographed by ButterflyCircle member Huang CJ at around 7:30am when the butterfly was attracted to a flowering Syzygium tree in a nature park. Besides being encountered feeding at flowers, the Great Orange Awlet has also been observed puddling at damp streambanks at times. *Crepuscular animals are those that are active primarily during twilight, that is, during dawn and dusk.